When we look to improve the user experience of software or websites, sometimes the best improvements aren’t slight tweaks to the interface but involve eliminating steps altogether. Here are four examples from the physical world that may inspire improvements in the digital world followed by four experiences that can use some refining. 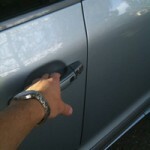 Keyless entry: We get in and out of our cars a lot—often with our hands full of kids and our conspicuous consumptions. There has been a steady evolution in improving the unlocking experience, from keys to buttons and now my favorite, the method that senses the key in your pocket and unlocks the door as soon as you insert your hand into the handle. 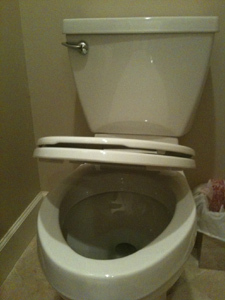 Auto-closing toilet seat: The germs, the slamming and poorly timed falls: Auto-closing toilet seats have effectively removed a step from this frequent and necessary biological process. Now us guys have no excuse for leaving that lid up! No Hotel check-out: An express check-out sounds like an improvement over a regular check-out but anything with the word “express” usually means slow (take for example United Express—these are actually the smaller and slower planes). But what’s the point of standing in a line when you need to leave? Having your folio slipped under the door or just emailed to you gives you more time to get to the airport and stand in more lines. 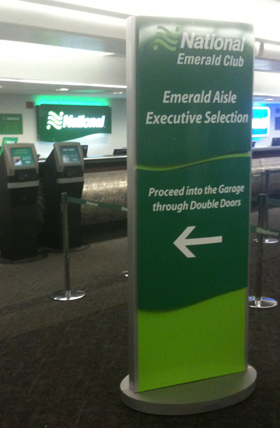 Go right to the Rental Car: You’ve finally reached your destination after hours of flight-delays only to stand in another line and be sold on the merits of optional insurance coverage or pre-paying on gas? What a horrible way to start a trip! Why not just go right to car and skip a line? National Rental Car gets a bonus point because not only do they eliminate a step but they give me some sense of control by letting me (and my wife and three kids) pick the car. There are of course factors other than ease of use which drive design decisions like business interest and security. While these constraints will never go away, I can think of four experiences that could use improving. 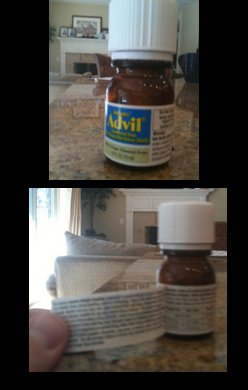 Children’s pain reliever dosing: Kids get sick early and often. Pain-relievers can mean a few extra hours of sleep for parent and child. It’s hard enough to hold and console a child while sleep-deprived, but you also have to locate and remember the correct dose of medicine to give. This well-intended omission leads to parents guessing the correct dose–often incorrectly. So much so that the FDA has recently recommended re-adding the instructions. Toilet Paper Guards: The only thing worse than industrial single-ply toilet paper is not being able to actually get any off the roll. 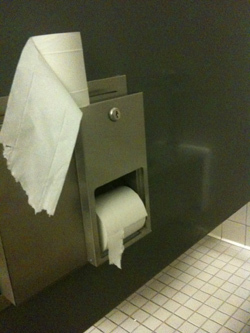 I know there’s a band of toilet paper thieves out there but does ripping off a square have to be so painful? 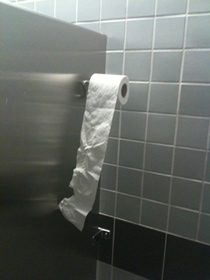 You’ve probably encountered these medieval torture chambers at your office or public bathroom. In fact, you can see in the two images how the “users” have worked around this restriction by sticking another roll of paper on-top of the dispenser or on the coat-hook. 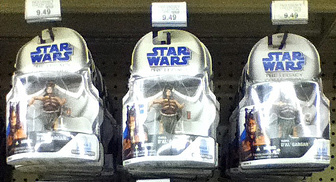 Plastic Packaging: Pretty much everything comes packed in plastic-wrapping these days. It often takes more time to open these plastic shells than the interest your child has in the contents. 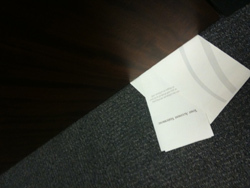 My favorites are the ones that require a box-cutter, scissors, screwdriver and then band-aids. Sorting the Recyclables: Recycling is great, but when you have a lunch tray with food, cans, paper, plastic and undetermined material, even the greenest person can make some mistakes and hold up the line. Forming the openings to be shaped like the appropriate contents probably helps. But I know one thing that will improve recycling rates even more: take the burden off the user and have the sorting done at the waste-plant. There might be some technology needed but many places can already sort the material. 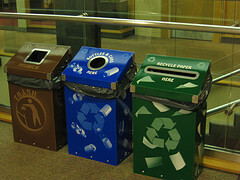 Having a single trash container that also recycles would be a win-win.